Do you want to know how to easily reduce your energy bill, cut electricity costs, save money and the environment. There’s a simple way to find ways to reduce your carbon footprint that you can do yourself at home. Using the P3 Kill A Watt EZ , you can quickly find the energy hog devices and “vampire electronics” in your home. Many electronics and appliances today constantly burn energy while in “standby” mode. A simple example of this is your remote control television… while it waits for the signal from the remote to turn “on” it is constantly using electricity to check for and interpret the signal. The Kill A Watt EZ, and its predecessor, the slightly less expensive original Kill A Watt Electricity Usage Monitor both let you plug the Kill A Watt device into the wall and the suspect electronic or appliance into the Kill A Watt device. 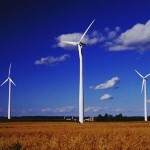 The device then reports on a number of stats on energy usage. Voltage (usually 120 in the US, give or take); Amperage (how much power the device is currently drawing); Watts used (the product of volts and amps); and Time since you plugged it in. The EZ model will also calculate the wattage per hour and allow you to input your electricity costs to calculate cost per time. On the original, you have to grab a calculator and do the math. To easily cut your electric bill and save energy, just go around your house and try out the Kill a Watt on everything that plugs in. One shocking item I found: An old CD player that draws 16 watts while in standby!!! That’s almost as much as a CFL left on constantly. I was also surprised to discover that my various chargers for cell phones, mp3 players etc, together drew another 12 watts. The quick fix for these was adding a power strip which I can now switch off when I’m not charging. Do it yourself and see how much you can reduce your carbon footprint and lower your energy consumption and save with the P3 Kill A Watt! Harness the power of the sun to power all of your battery-powered devices. 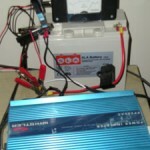 In this simple example, I constructed a solar AA battery charger suitable for use with NiCd batteries. From various internet sources, I read up on the proper ways to charge NiCd batteries. I decided for this initial example to use only NiCd because they are readily available, cheap and typically accidental overcharging simply reduces the batteries lifespan, rather than creating a fire hazard as with a lithium ion. According to several sites, the safe “slow charge” method is to charge the battery with 1/10th of its capacity for 10-12 hours as so-called “overnight” charger do. These charges require the user to keep track of when they began the charge and remove the charger at the appropriate time as they do not incorporate any sophisticated ways to test the charge status. The AA batteries I purchased are rated at 600mAh, so the slow charging method would require roughly 10-12 hours at 60mA. Using some broken solar cells I purchased online, I connected together 5 pieces, in series. Each piece produced roughly 80mA in direct sunlight and roughly .5 volts each (smaller pieces produced less amperage). Connected in series, this produced roughly 2.5 volts at 80mA max (in my tests, indirect sunlight through my window produced roughly 50-70mA – perfectly suited to charging the AA battery. The voltage was also ideal at 2.5v as to create a voltage differential to ensure energy flowed into the battery (1.2v) even after the voltage drop from the diode. The diode serves one important function in this set up and prevents the batery from discharging during lowlight conditions by ensuring energy only flows into the battery and not back out through the solar cells. The entire assembly is mounted to an old CD-R as a sturdy re-claimed backing. Mounting the battery clip to the bottom provides enough angle to point the solar cells out the window. While the efficiency of charging only one AA battery in this charger is not ideal, it is an excellent proof of concept and I have tested its ability to fully charge a NiCD AA battery in one sunnny day many times with succeess. 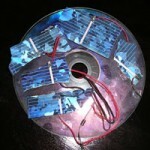 For a larger scale, more useful solar device, check out the small solar generator I created next.